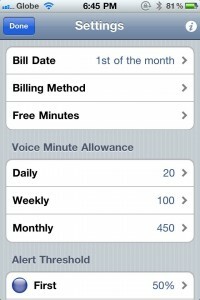 With VoiceMan, you can easily monitor your voice minutes without having to check with your provider all the time. 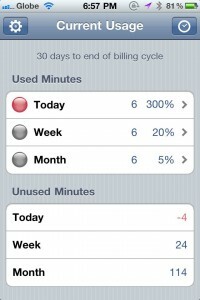 The app allows you to set your daily, weekly, and monthly usage limits. 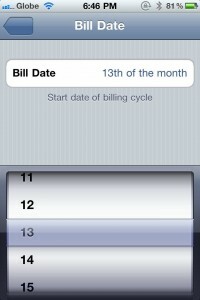 You can also specify the bill date. That’s the default settings, so I had to change things to match my bill date and minutes. Here, you can see that I have set the limits to low figures, especially for the daily one. I did this on purpose to see what would happen if I exceeded the limit. Sure enough, after I had a 5-minute conversation with my sister, I got a notification immediately after hanging up. Over time, you can also monitor just how much you have exceed (or not) your limits. For only $3.99, I think that VoiceMan is worth purchasing and using, especially if you tend to get carried away talking on the phone. Now here’s the fun part. 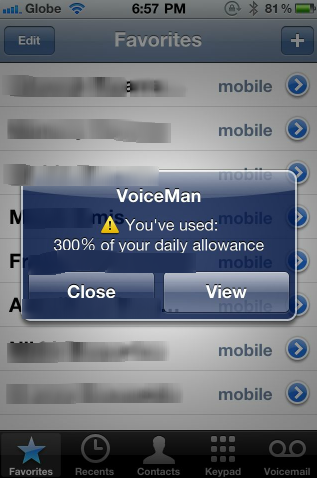 I have a promo code to give away so that you can download VoiceMan for free! All that you need to do is follow the steps below. One winner will be selected at random from the commenters at or around 8:pm EST on Monday, September 19th. Winners will be notified via Twitter, and we will send you the promo code, which you can redeem via the App Store. Important: You can only tweet about the contest ONCE per day till the deadline. If you tweet more than once a day, all your entries will be disqualified.